Business leaders in the Sussex town of Eastbourne are expected to hold a protest today over the disruption being caused to the area's transport network by the ongoing dispute between Southern Railways and the unions over changes to the role of train guards. Members of the Eastbourne Chamber of Commerce and the south coast chambers claim that problems on Southern Railways have cost the local economy more than three hundred million pounds. The business leaders say the rail operator, the RMT and ASLEF unions, and the Transport minister all bear responsibility for the continuing row. Last week Friday it was the turn of passengers to once again call for the row to be resolved. 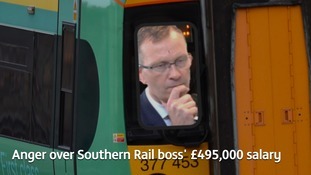 Southern Railway said it expects to run three quarters of its normal service during a fresh 24-hour strike by some of its staff next week. Southern Railway hopes to run about 75% of its train services during a strike next week Wednesday. The train drivers' union ASLEF has tonight rejected a deal aimed at resolving the long-running dispute over driver-only trains on Southern Rail. It was thought that the majority of members would agree to the deal - but in a shock move - drivers decided by 54 to 46% NOT to accept the recommendation. The head of Govia Thameslink Railway - Southern's parent company, has given his reaction to the decision of ASLEF union members to reject a deal in the ongoing dispute about driver-only trains. Train drivers have rejected a deal thrashed out between union bosses and Southern Railway - sparking fears of further strikes. The members of the train drivers' union ASLEF have rejected a deal aimed at resolving the long-running dispute over the introduction of driver-only trains on Southern.